Tag line: "He was never in time for his classes... He wasn't in time for his dinner... Then one day... he wasn't in his time at all"
Robert Zemeckis’ Back to the Future isn’t the sort of film that will preach at you. It doesn’t weave a complex story, or examine man’s role in the universe. The sole purpose of this 1985 box-office mega-hit is to entertain, and on that level, it’s a rousing success. Marty McFly (Michael J. Fox) isn’t your average teen. Sure, he has a cute girlfriend (Claudia Wells), loves to ride his skateboard, and even plays a little guitar, but aside from that, his life is a complete mess: his grades are bad; his mother, Lorraine (Lea Thompson) drinks too much; and his dad, George (Crispin Glover), is still afraid of the bully who tormented him in high school (Biff, played by Thomas F. Wilson). What’s more, his closest friend is Doc Brown (Christopher Lloyd), an elderly inventor who claims he’s just created the world’s first functioning time machine, which he built inside a DeLorean car! To Marty’s amazement, the time machine works, but when an unforeseen complication sends him back to the year 1955, Marty inadvertently prevents his parents (who were teenagers at the time) from ever meeting each other, thus putting his own existence in jeopardy. With the help of a younger Doc Brown, Marty tries to correct his mistake by making the timid George ask Lorraine to the upcoming “Enchantment under the Sea” dance (where the two are supposed to kiss and fall in love). At the same time, Doc Brown is working on a way to get Marty back to 1985, but even if he does return, what sort of future will be waiting there for him? Writer / director Zemeckis, no stranger to popcorn fare (the year before he made this movie, Zemeckis helmed the action / adventure flick, Romancing the Stone), fills Back to the Future with one great scene after another. The sequence where Marty and Doc Brown first test the time machine in a mall parking lot is a hoot (not even the sudden appearance of machine gun-wielding Libyan terrorists, come to retrieve the plutonium Doc Brown stole from them, can spoil the good times). But it’s when the action shifts to 1955 that things really get interesting. 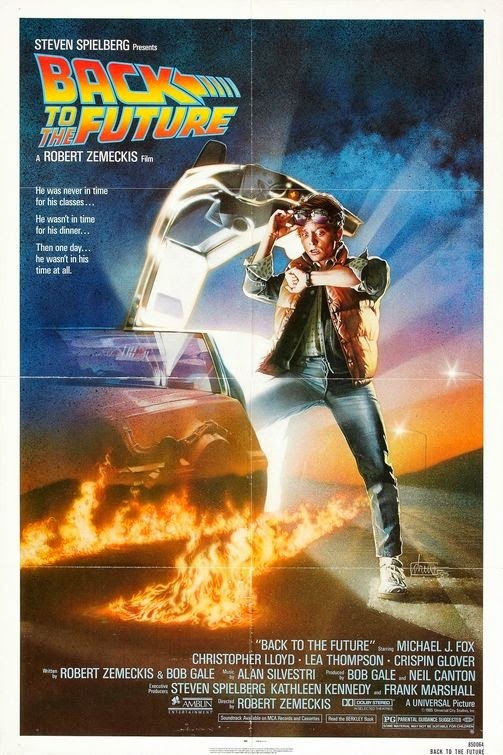 Having altered the future, Marty finds himself in the uncomfortable position of rebuking the sexual advances of his own mother (in teenage form), and trying to instill confidence in his nerdy father in order to put things right again (knowing George loves sci-fi, Marty poses as an alien by putting on an ‘80s radiation suit and telling George he’s “Darth Vader from the planet Vulcan”, and will “melt his brain” if he doesn’t ask Lorraine to the dance). Best of all are the moments featuring Marty and the younger Doc Brown, who’s thrilled to learn that one of his inventions actually works (even if it does take him 30 years to perfect it). These scenes, plus so many others (Marty “inventing” a ‘50s-style skateboard; him playing guitar at the "Enchantment Under the Sea" dance; the lightning and the clock tower), are why Back to the Future is still, almost 30 years later, a terrifically entertaining experience. That’s not to say the movie has no moral whatsoever (the side story of George and his fear of letting others read his sci-fi novels carries a clear “see your dreams through” message), and it does, on occasion, get a little dark (the Libyan terrorists start Marty’s adventure off on a depressing note), but in the end, Back to the Future is a classic because its good, wholesome fun. There are plenty of movies out there that will make you think; this one straps you in and whispers “Enjoy the ride”.